Oh sweet, I guess this is my 100th posts on automation in Salesforce. I would like to thank everyone for their kind messages and support. I also wanted to share the good news, now Automation Champion blog is listed as Process Builder resource on Trailhead along with awesome Jenwlee’s Salesforce blog, she has amazing contents on Process Builder and Flow. I’m going to share a solution for the first requirement in this article and will publish another article for the second requirement i.e. Blog 57. 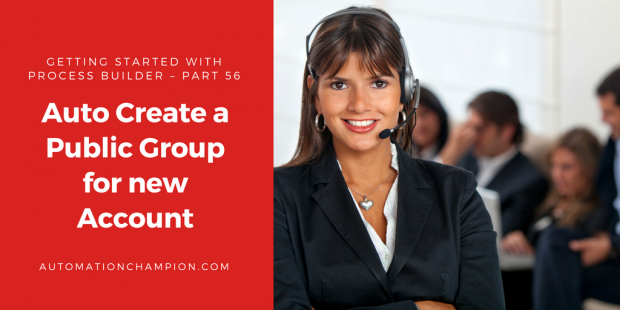 Assumption: – I’m going to use Account Number as public group Label and Group Name. The reason behind it, we need a unique name for the public group name and account number (Standard field on account object) is always unique for business. If you want to use something else like Account Name Plus Account Number or ID, then consider using formula field. –> DeveloperName is the unique name of the object in the API. –> If you want to create a Queue then, set Type value equals to Queue. 4. Save the Flow (Type: – Autolaunched Flow) with name Create public group Flow and close the canvas. Don’t forget to Activate the Flow. –> Make sure to select the checkbox Do you want to execute the actions only when specified changes are made to the record? When you select this option, the process ignores record changes that aren’t relevant to your defined criteria. 5. The next step is to add a Scheduled action to Process. Under Scheduled Actions, click Set Schedule. Set the schedule for 0 Hours after the account Last Modified Date. 6. Now that you have a schedule add the Flows action to it. For this select action type Flow, Use Field Picker to choose the field [Account].AccountNumber, as shown in the following screenshot. hello, when i was setting criteria for action. After creating a flow its giving an run time warning Create_New_Public_Group is not connected to anything. How to resolve this or what should i have to put there.